There is no better way to test the toughness of an automobile than by entering it in the World Rally Championships (WRC). Rally cars are engineered to race over paved, dirt and snow/ice covered roads at breakneck speeds and in all kinds of weather. Success in these races virtually guarantees sparking consumer interest in purchasing the production car. Subaru understood this when they first entered the WRC back in 1990. 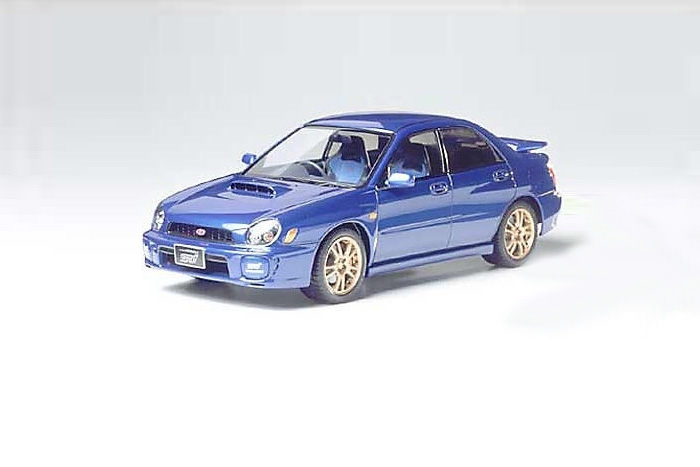 Their first contender, the Legacy was succeeded by the more compact Impreza, which was imbued with two years of tested technology. This sports sedan generated intense popularity among consumers looking for a street car with the guts of a WRC contender. In August 2000, a second generation of the Impreza was born. One of the specially tuned versions of this car was the Impreza WRX STi (Subaru Tecnica International). Its 2-litre 4-cylinder turbo engine adopts a reinforced cylinder block, molybdenum coated steel pistons, high capacity turbo and intercooler. The power of the STi version was boosted to 280hp with a 38kgm maximum torque. This power is efficiently transmitted to the four wheels via a 6-speed manual transmission, also developed by STi. The suspension adopts rally-proven 4-wheel struts, ensuring a smooth ride over all kinds of road conditions. Blister style over-fenders on the powerful four-door body and an enlarged air intake on the hood give the Impreza WRX STi, as its name suggests, a truly impressive appearance.